It's that time of the year again when we get to vote and give recognition to our favorite restaurants and chefs which give us gastronomic delights. I'm inviting you guys to participate in The Choice 2017 by voting for your favorite picks. Brought to you by Our Awesome Planet, World Food Expo, and The KTG. Every month, every week, and almost every day it seems, there's a new restaurant opening in Metro Manila. There are a lot of great new dining choices, side by side with the perennials, the classics that we grew up with. As food bloggers, writers, and members of the F&B industry, we're always very curious about the crowd favorites. The popular vote, if you will. So, Our Awesome Planet, the Blogger Collective known as the KTG (Kain Tulog Gang) and World Food Expo (WOFEX) have partnered to conduct the People's Choice for their Favorite Food, Restaurants, Bars, and more …. or simply, "The Choice". We conducted an intense first round of voting among ourselves, and our resulting Finalists have made us very pleased: we feel it's a very diverse and fair representation of all our favorites from all over the Philippines. The categories are very broad, as they should be in a democratic vote. Instead, we'd like "The Choice" to be the Golden Globes: a bit more irreverent, surely less formal, and yes, it ought to be greatly biased. After all, YOU will be voting for your favorites, this is YOUR CHOICE!!! The Choice 2017 Voting is open for 3 weeks starting on July 3, Monday and ends on July 23, 2017, Sunday. 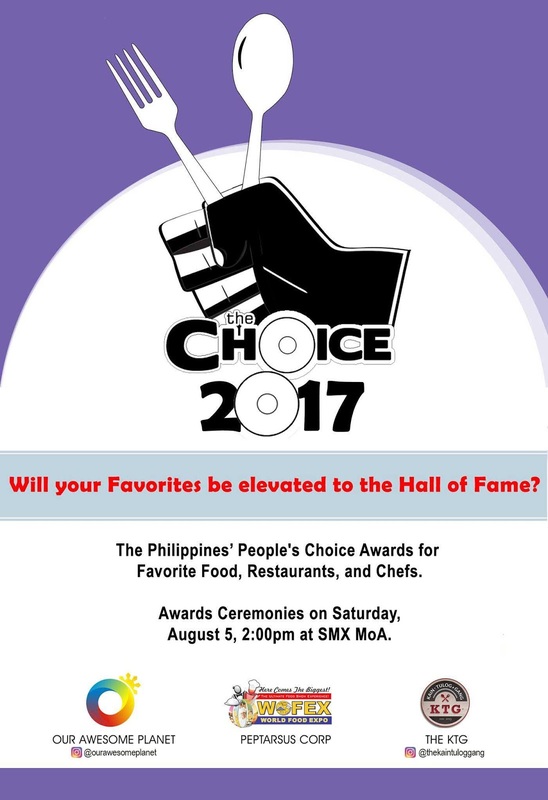 The Choice Restaurant Awards will be on August 5, Saturday at the SMX Convention Center at the MoA during the World Food Expo (WOFEX) 2017! 1. For the Favorite New Restaurant category, our coverage period includes restaurants that opened between June 1, 2016 to May 31, 2017. 2. There are 60 questions in this survey and answering this survey should take only around 10-15 minutes. It is best to give a definitive answer on each question and feel free to skip if you can't decide. 3. All answers are treated confidential and final once you click on the submit button. One survey response for one person only. 4. Please give us your name and email address for our random validation of the survey responses. 5. We've added your Favorite Hotel categories as part of this year's The Choice 2017 survey! "The KTG is a group of friends who all just happen to be some of the top food bloggers in the Philippines; every one of their individual blogs ranks among the highest ranking and most influential online publications dedicated to food, entertainment, and travel. The KTG is composed of some of the more senior food bloggers in the country, including Richie Zamora of "The Pickiest Eater in the World', and Jill Tan of 'The Food Scout”. Representing the younger generation are "Food in the Bag", "The Hungry Kat", and "Nines vs. Food". And from the world of showbiz, Mr. Chuckie Dreyfus, a foodie who's also a respected tech blogger. The KTG's objectives are not limited to discovering the best restaurants, however. While it's affectionately called the "Kain Tulog Gang", it's officially participated in relief efforts in Tacloban and Iloilo after Yolanda; and in Metro Manila, this "Kapatiran sa Tulong at Ginhawa" is on a constant mission to contribute in providing joy and comfort to the less fortunate." and one of the Top 10 Travel Blogs in the World….